Like many children her age, 4-year-old Makenna Pelletier of Fort Kent dreamed of going to Walt Disney World in Orlando, Florida, and meeting one of her favorite characters, Minnie Mouse. PRESQUE ISLE, Maine — Like many children her age, 4-year-old Makenna Pelletier of Fort Kent dreamed of going to Walt Disney World in Orlando, Florida, and meeting one of her favorite characters, Minnie Mouse. In April 2018, her wish came true thanks to the people behind the Maine chapter of the Make-A-Wish Foundation. Now Makenna and her family want to give back to the foundation that helped them create lasting memories at a time when they truly needed to visit “the happiest place on Earth.” In September 2016, Makenna was diagnosed with low-grade glioma, a type of brain tumor that originates in the glial cells, and has since completed chemotherapy treatment to remove tumors from her brain stem. Doctors at the Brewer, Maine-based clinic where Makenna received treatments told her parents, Danielle and Chad Pelletier in 2017 about the Make-A-Wish Foundation and how their mission is to grant children with critical illnesses their ultimate wish. Nearly a year later, the family was headed to Walt Disney World in style. 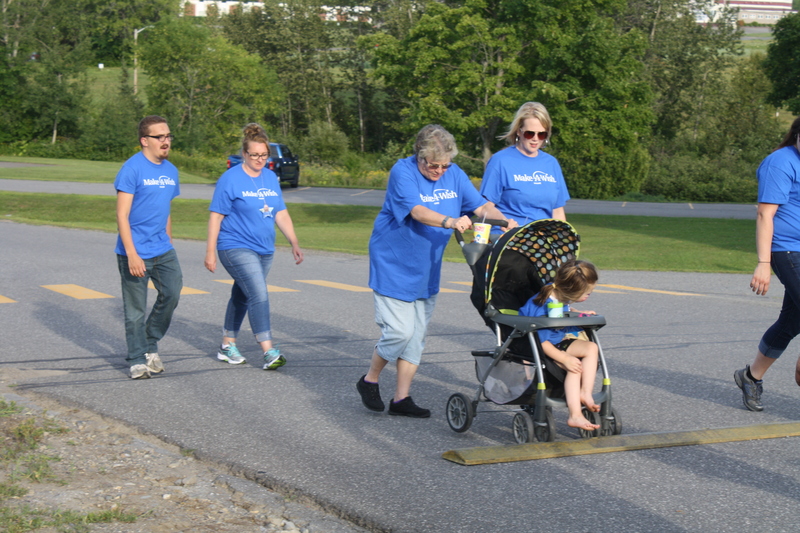 Makenna Pelletier, 4, (in stroller) of Fort Kent participates in the Make-A-Wish Foundation’s Walk for Wishes on Saturday, Aug. 11 with her mother Danielle Pelletier (right) and grandmother Glenna Guerrette of St. Agatha. To show their appreciation for the foundation, Danielle and Makenna Pelletier, along with Danielle’s mother Glenna Guerrette of St. Agatha, and cousin Julie Dumond, of Madawaska, travelled to the University of Maine at Presque Isle on Saturday, Aug. 11 to participate in one of two annual Make-A-Wish Walk for Wishes held in Maine each year. The family also set up their own donation page on the Make-A-Wish website and raised $1,160 for the foundation. The Walk for Wishes is one of the foundation’s largest fundraisers, according to Rebekah Roy, marketing manager for the Make-A-Wish Maine chapter based in Scarborough. Throughout the year, the chapter hosts Wish Nights, sports tournaments and block parties and also accepts donations from individuals and organizations who host their own fundraisers. Although Makenna’s illness and subsequent treatments have affected her gait, giving her a slight limp when she walks, her mother said that she has taken everything in stride and confronted all challenges with a positive attitude. The family’s trip to Walt Disney World was an experience that helped Makenna truly be herself again. For more information about the Maine chapter of Make-A-Wish foundation, including how to donate or host a fundraiser, go to http://maine.wish.org/.